Bend is a darling little mountain town nestled at the base of the Cascades, along the Deschutes River in Central Oregon. And with its many rivers, mountains, hiking trails, lakes, and clear, crisp, high desert climate, it is the ideal home for adventure-lovers. 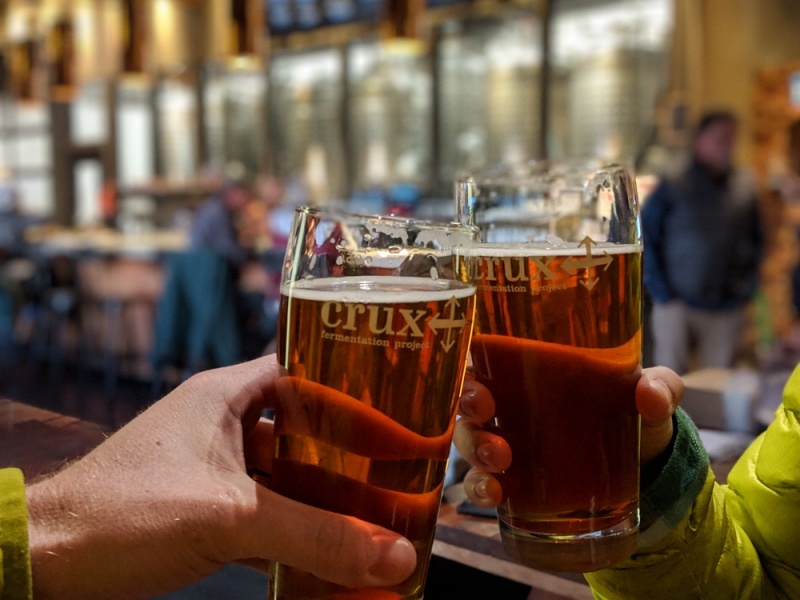 It is also home to plenty of craft breweries and restaurants serving up fresh, local fare to keep you satisfied after a day exploring the region. 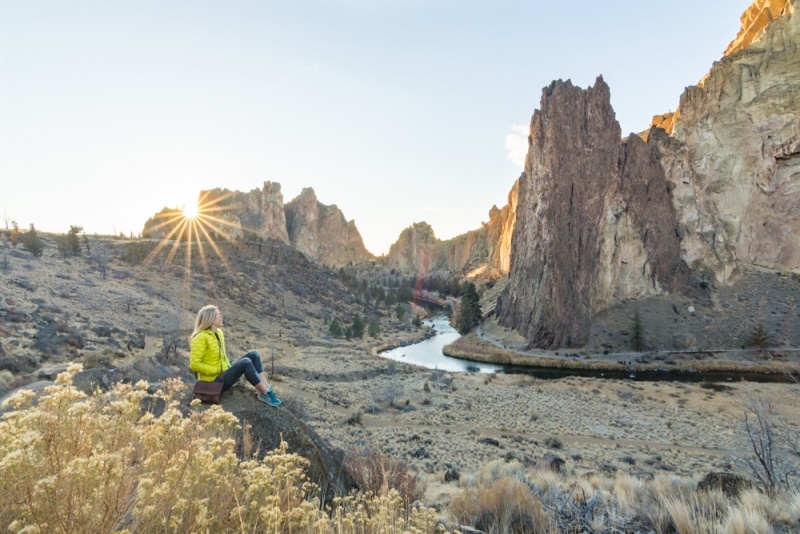 Check out our list of the 15 things you must do during your trip to Bend, Oregon! Bend is located in Central Oregon, about 160 miles from the city of Portland. The closest airport is Redmond Municipal Airport which is served by four air carriers; Alaska Air, American Airlines, Delta Airlines, and United/United Express. It offers daily direct flights to/from Denver, LA, Phoenix, Portland, Salt Lake City, San Francisco, and Seattle. The airport is about 17 miles outside of Bend, in the nearby city of Redmond. There are no direct trains or buses although you can piece together a public transit trip fairly easily on Amtrak. If you plan on driving to Bend from one of the larger cities nearby, be sure to check the road conditions prior to setting off. You’ll need to cross a mountain pass and you may be required to carry chains if it’s been snowing or if there is a threat of snow. The city of Bend sits at an elevation of 3,623′ so it has a “high desert” climate consisting of clear, sunny days and cool nights. Regardless of the time of year that you visit, you’ll find plenty of outdoor activities to keep you busy. Summers are ideal for hiking, rock climbing, and kayaking, while winters are perfect for skiing or snowboarding on Mt. Bachelor. Summers are short but quite pleasant, with temperatures reaching into the 80°s. And winters can be very cool, with temperatures dropping into the 20°s. The average annual precipitation is less than 12 inches, most of which falls between November and February as snow. No matter what time of year you visit, be sure to bring warm clothing as the high desert climate brings chilly evenings year round. Many of the trailheads around Central Oregon are considered “sno-parks” and you’ll be required to purchase a Sno-Park Pass to park there from November 1st through April 30th. Be sure to buy one ahead of time (they are not sold at the trailheads) and display it in your car. Similarly, many of the trailheads around Central Oregon require a day use fee to park. You can pay using cash and the envelopes provided, or you can purchase an Annual Northwest Forest Pass for $30. When you consider the size and population of Bend, the amount of breweries that have been able to maintain success here is quite impressive. There are currently 22 breweries in Bend – that’s about one for every 4,500 people. And not only do they make amazing beer, but they also offer lively tasting rooms, fun events, super friendly and knowledgeable staff members, and stylish gear that you can take home as a souvenir! Crux Fermentation Project has an awesome outdoor space with a food truck that serves up tasty tacos. 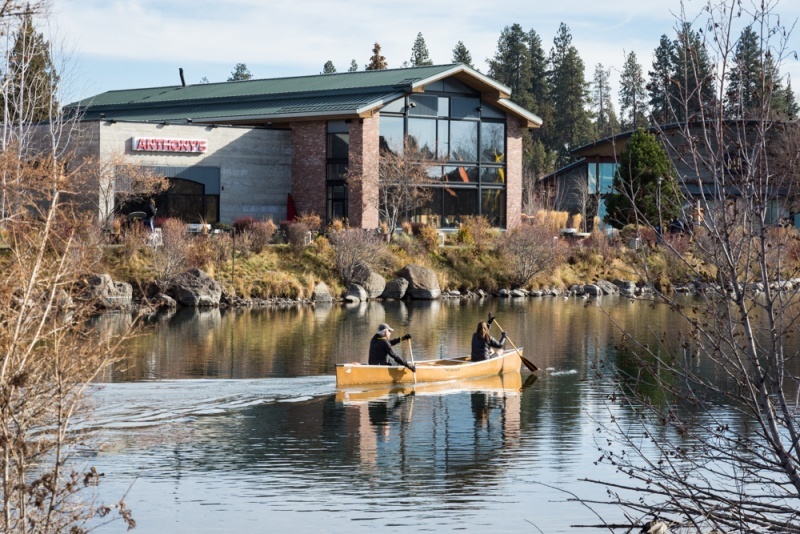 Deschutes Brewery Bend Public House is a Bend institution and a must visit during your trip! Boneyard Beer Pub has a new pub space that offers plenty of comfy seating and big screen TVs. Get the most out of your craft brewery experience by following the Bend Ale Trail! There are 18 breweries included in the trail and they are all relatively close to each other. Follow the map here and be sure you assign a designated driver. You’ll love sampling the goods in Beer Town USA! 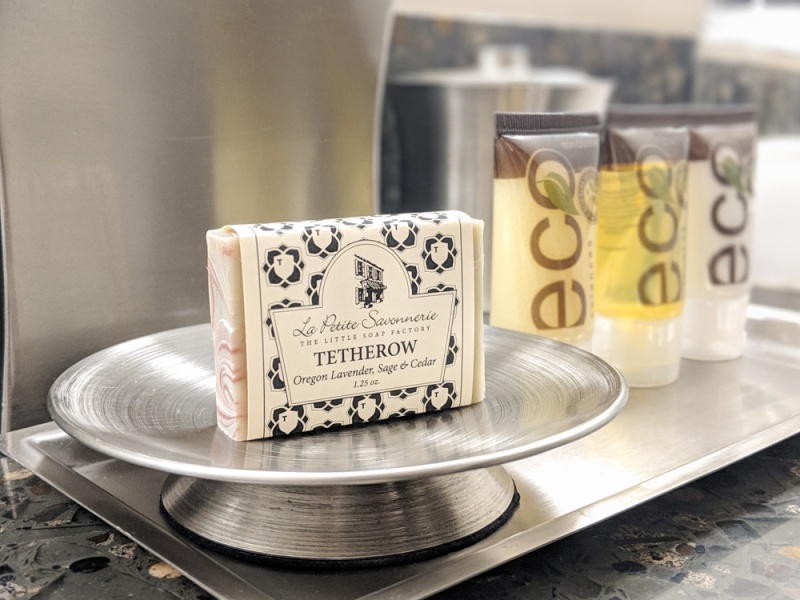 Tetherow Lodges Hotel is THE place to stay during your visit to Bend. Situated on one of the most beautiful golf courses in Oregon, the views from the lodge are outstanding in every direction. 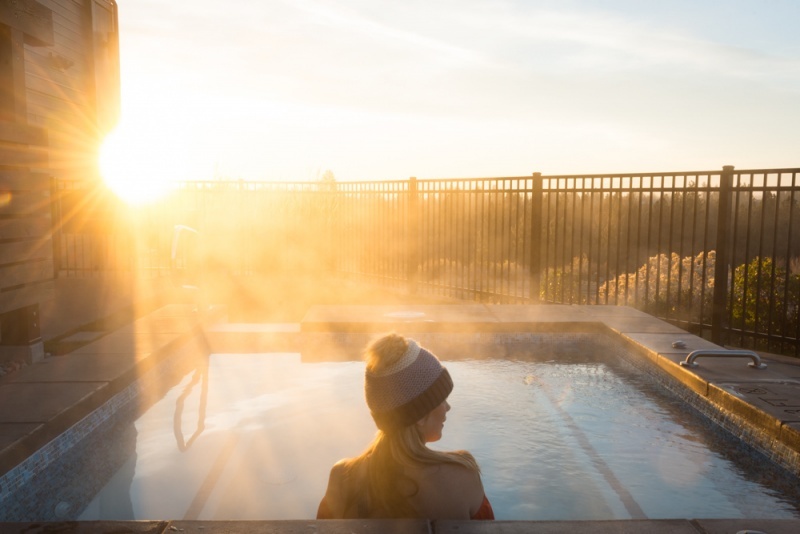 Plus they offer a heated outdoor pool, two hot tubs, cabanas, fire pits, a fitness center, and miles of trails on their property so you can soak in all of the surrounding beauty! Rooms are large with modern decor and amazingly comfortable beds. 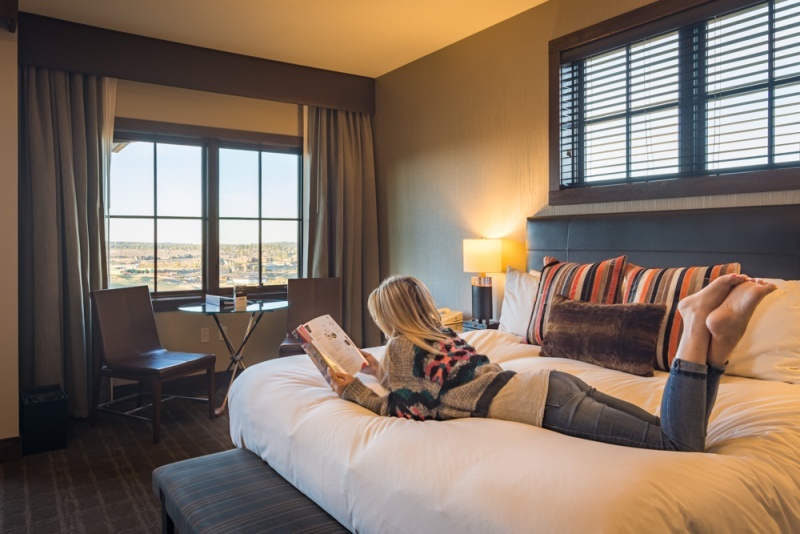 Once you sink into that plush, cozy bedding at the end of a long day exploring the city, you’ll never want to get out again! When booking a room, opt to spend a bit more and get a room with a fireplace. It’s the perfect spot to cuddle up with a glass of wine and a good book in the evenings. Tetherow is just minutes from Downtown Bend but if you’d rather stay onsite to eat and drink, plenty of options are available to you. Solomon’s has a rotating menu and offers dishes that are unique to the Pacific Northwest like pheasant and elk. They have an extensive wine collection and an array of desserts to choose from. Try the tacos at The Row! 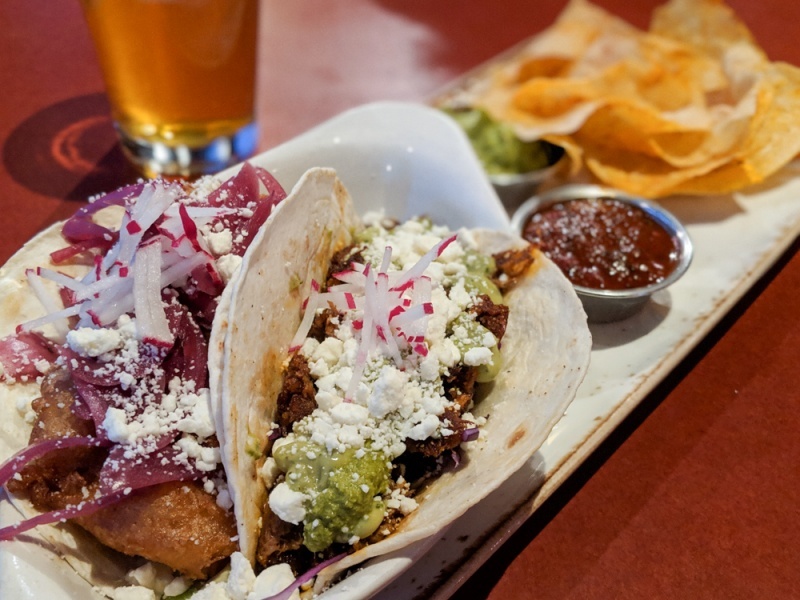 The Row is a pub that offers food and plenty of large flat screen TVs – it’s the perfect place to watch your favorite sporting events (be sure to try the tacos). And The Cafe offers grab-and-go sandwiches and salads as well as yummy coffee and smoothie concoctions. And if you want to go into town, the Tetherow Shuttle is available 7 days a week for guests! There are hundreds of hiking trails around Central Oregon that offer varying degrees of difficulty and dramatically different scenery. If you’re looking for scenic viewpoints, the hike to South Sister is one of the best hikes you can do. This 11.2 mile out-and-back trail begins at the Devil’s Lake Campground. It is a very difficult climb to the peak and is only recommended for experienced hikers. 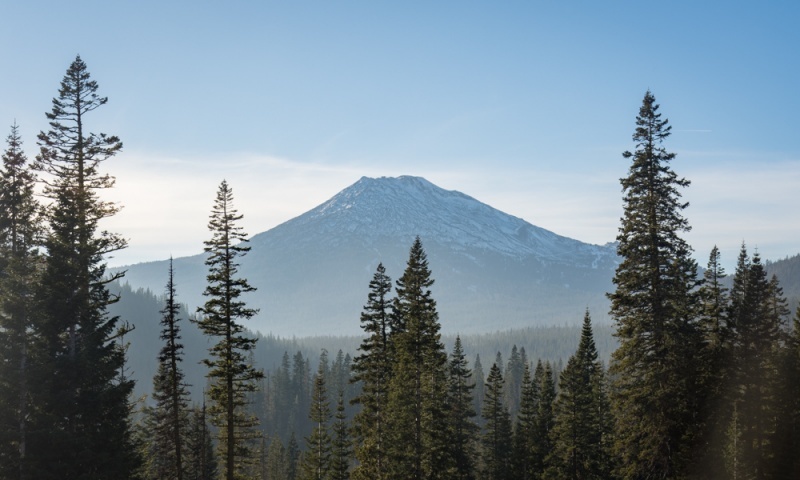 The South Sister peak is the 3rd tallest mountain in Oregon and once you reach the top you’ll be rewarded with spectacular views of the other Sisters, Three Fingered Jack, Broken Top, and Mount Bachelor. Be sure to check the weather before you start to ensure clear skies. Hike the Tumalo Mountain Trail to the Tumalo Mountain Summit for gorgeous views of Mount Bachelor. It’s 2 miles each way but you’ll have a steep climb on the way to the top. The hike begins at the Dutchman Flat Sno-Park, across from the Mount Bachelor parking lot. Beware that in the wintertime this trail gets icy and you’ll need crampons. 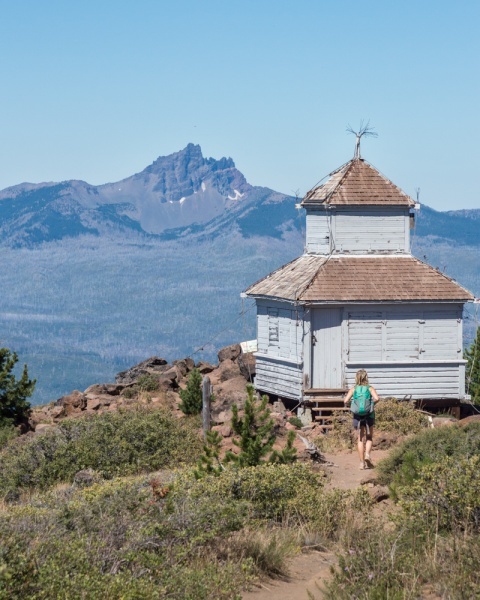 If you’re looking for an easier hike that offers beautiful views, the walk to the top of Lava Butte in Newberry National Volcanic Monument is a good choice. The road is paved the whole way (in fact, the visitors center runs a shuttle to the top in the summer) and it’s just 1.75 miles each way. There is also a .25 mile walk around the rim of the volcano with educational signage along the way. There are several short, relatively flat lake hikes in the area as well. Todd Lake and Sparks Lake are popular not only for hiking but also for kayaking and swimming in the summer months. There are several popular shopping areas in Bend including; the Downtown area, Bend Factory Stores, and the Old Mill. Downtown Bend is a darling street filled with unique boutiques, yummy restaurants, gourmet coffee shops, and even a lively brewery. It’s especially fun to shop here in the summer on the first Friday of every month for the Downtown Bend First Friday Art Walk event. The factory outlet stores offer great prices on well known brands. And the Old Mill offers plenty of popular shops and restaurants as well as a movie theater if you want to take a break from shopping to catch a flick. 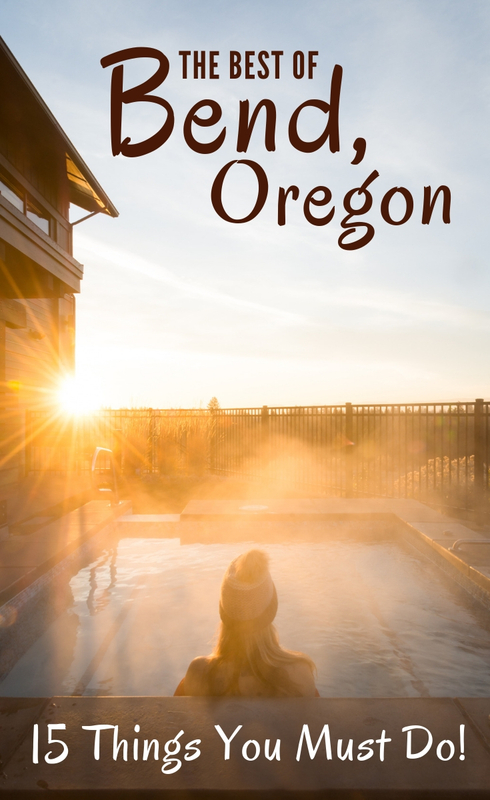 And the number one reason to shop during your trip to Oregon? No sales tax! 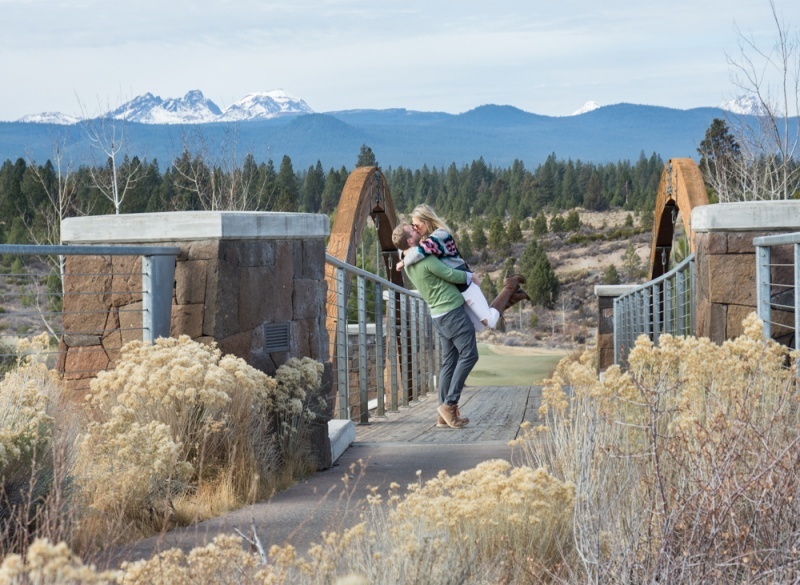 Along with being known as the beer capital of Oregon, Bend is also widely known as “the Palm Springs of the North” due to the fact that it is home to more than two dozen golf courses! Courses range in price and skill level so you can find the perfect one for you to tackle during your trip. 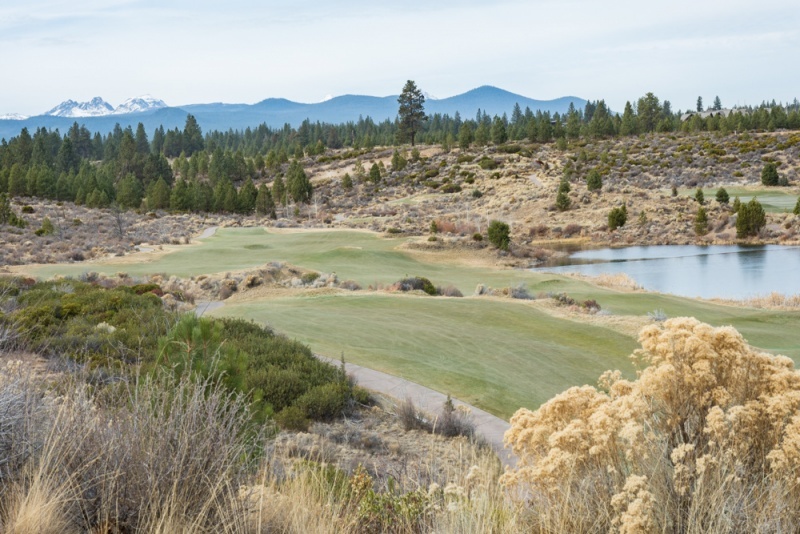 The Tetherow golf course in Bend is well known as it was recently voted a Top 10 course in Oregon by Golf Digest. Designed by David McLay Kidd, this 18-hole championship semi-private course offers spectacular views of the surrounding Cascade peaks. They also offer every amenity you could ask for including caddies to help you make the most of your experience. Be sure to reserve a tee time early as this course is quite popular with locals and visitors alike. Call 844-431-9701 to reserve your spot. Guests of the Tetherow Lodge receive special rates! Bend is a lively little town with special events and activities happening frequently throughout the year. The Downtown Bend First Friday Art Walk is a popular event that takes place on the First Friday of every month year round. You can wander around the cute downtown shops and art galleries while sampling their complimentary beverages and snacks. Pole Pedal Paddle is a large, multi-sport event that includes downhill skiing, Nordic skiing, cycling, running, and kayaking. Benefits go to the Mt. Bachelor Sports Education Foundation (MSBEF). Even if you don’t participate, it’s a blast to watch! The date changes every year but usually takes place in the spring. If you happen to visit Bend during the month of August you’ll definitely want to check out the Bend Brewfest! It’s a lively event that offers you the chance to sample beers from the local breweries around town – all in one convenient space. You’ll meet a ton of new friends and have a blast sampling beer in the sunshine. The date changes every year so be sure to check their website. For a list of all of the events going on around Bend, check out the massive events calendar on the tourism board’s website! 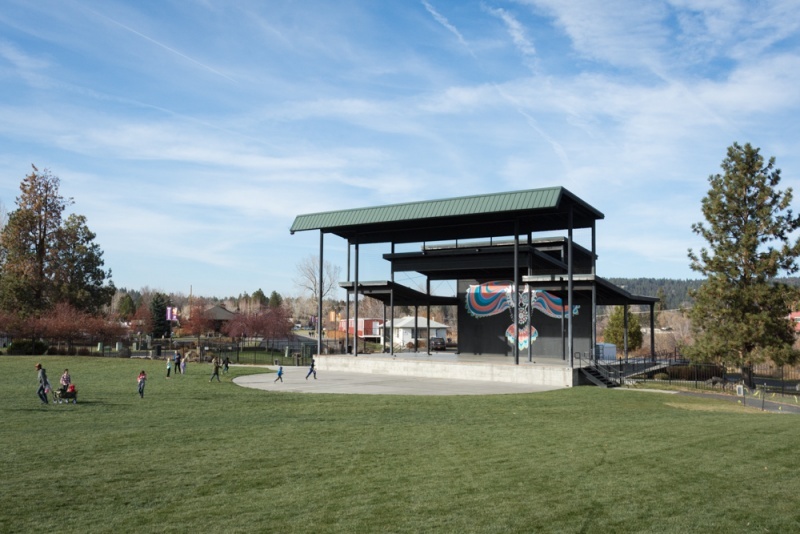 The Les Schwab Amphitheater is a gorgeous outdoor space perched right on the banks of the river in the Old Mill District (a great place to shop!). It is the place to go in Bend for both ticketed and free concerts, and also other events like brewfests and races. The seating is on the grass so you can bring low-profile chairs or a blanket. The atmosphere is casual and they usually have several food and beer carts on hand to keep you fed and hydrated. Check out their list of upcoming events here! Tumalo Falls is an 89-foot tall waterfall located about 20 miles outside of Bend. To access it you can either choose a 7-mile lightly trafficked loop trail along the river, or simply drive up to the base of the falls. There is a small viewing platform right off the parking lot as well as one at the top of the falls. The trek is short, just 1/4 mile each way, but it’s an uphill climb to the top. If you choose the 7-mile hike you’ll enjoy a fairly flat, peaceful walk that follows the river and offers spectacular views along the way. You’ll follow the Tumalo Creek trail which is open to both dogs and mountain bikers. At the base of the falls you’ll find a picnic area, restrooms, and a parking lot where you’ll have to pay a $5 day-use parking fee. Keep in mind that the 3-mile road to the falls is unpaved and may not be an ideal drive depending on the type of vehicle you’re driving. The parking lot is small so most people park on the side of the road before the one-lane bridge. Rock climbers from all over the US flock to Smith Rock State Park to have a go at the thousands of climbs in the park. The park covers 650 acres and the sheer rock faces are carved from welded tuff and basalt, perfect for climbing. Here you’ll find dynamic routes that are ideal for sport climbing, traditional climbing, multi-pitch climbing, and bouldering. If climbing isn’t your sport of choice, there are also plenty of hiking and mountain biking trails. The park has a walk-in area for tent camping on a first come, first served basis if you’d like to spend a night in the park. Mount Bachelor is a stratovolcano that sits in the Cascade Range of Central Oregon. Named Bachelor as it “stands apart” from the Three Sisters peaks that are located nearby. Mount Bachelor reaches an elevation of 9,068 feet and avid skiers and snowboarders flock to the mountain during the winter season as the weather is generally crisp and clear. If you’re not into those winter sports, there are plenty of other recreational activities to keep you busy. The summit offers an observatory and there are plenty of areas that are open for snowshoeing, snow tubing, dog sledding, and more. Or simply take a scenic chairlift ride to the top to experience the amazing views of the surrounding area! Buy lift tickets and check out events on the mountain on their website prior to your visit. If your trip to Bend occurs during the summer months and you want to take advantage of the sunny weather, make time to float down the Deschutes River! The city has made this 60-90 minute float both easy and fun by organizing a Ride the River Shuttle which will deliver you back to your car once your float is complete for the bargain price of $3. First you’ll need to obtain a quality flotation device. You can either bring/buy your own or rent one from one of the many gear shops nearby. The shuttle begins and ends at Bend Park & Float and stops at Riverbend Park and Drake Park. If the water is especially chilly (as it often is) or if you’d prefer another water activity, you can also rent stand-up paddle boards or kayaks. Skip the booze, don’t litter, and be respectful of the landscape as well as the people you encounter along your river journey. When the weather outside is chilly there’s nothing quite like lounging in a hot tub. Tetherow has a heated pool and two hot tubs offering beautiful views of the surrounding landscape. It’s the perfect place to unwind after a long day while enjoying the sunset. Keep in mind that the pool area is only open to guests of the hotel. If you’re not staying at Tetherow then the McMenamins Old St. Francis School has an indoor soaking pool that is reminiscent of an old Greek bathhouse. The saltwater pool is open to adults from 11:00am – 8:00pm daily, and supervised minors from 11:00am – 6:00pm. The fee to soak is $5.00 per person and be sure to bring your photo ID and a towel. And once you’ve finished relaxing in the water, try your luck at finding the secret Broom Closet Bar for a glass of vino. 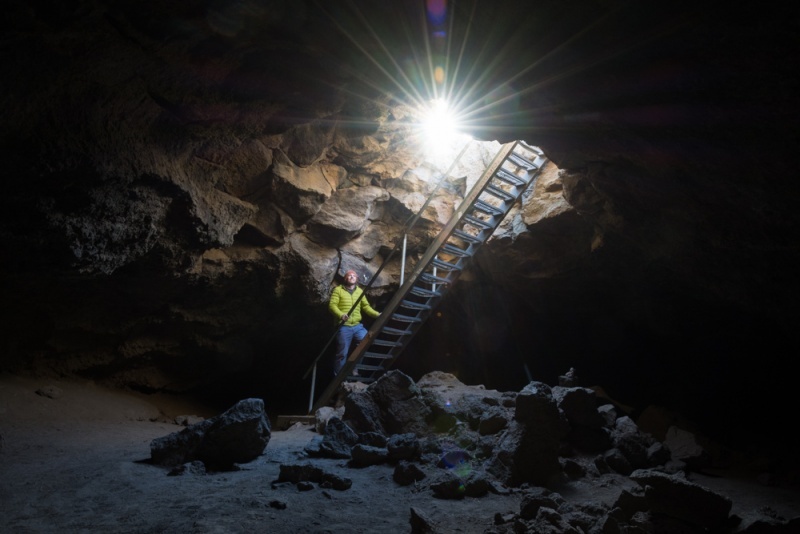 Not only does Bend have several volcanoes that you can climb, but it also has quite a few lava tubes that are open for the public to explore. The most popular and easiest to access is the Lava River Cave. It is part of the Newberry National Volcanic Monument and easy to pair with the hike to the top of Lava Buttes. You can explore the cave as part of a guided tour or wander around on your own. If you are looking for more “off-the-beaten-path” caves that aren’t as heavily trafficked, check out Boyd Cave and Skeleton Cave. Boyd Cave is about 1,880 feet long and Skeleton Cave is about 2,900 feet long. You’ll need a headlamp, shoes with decent traction and ankle support, and a jacket for both. They are both dark, rocky, and cold but really fun to explore! 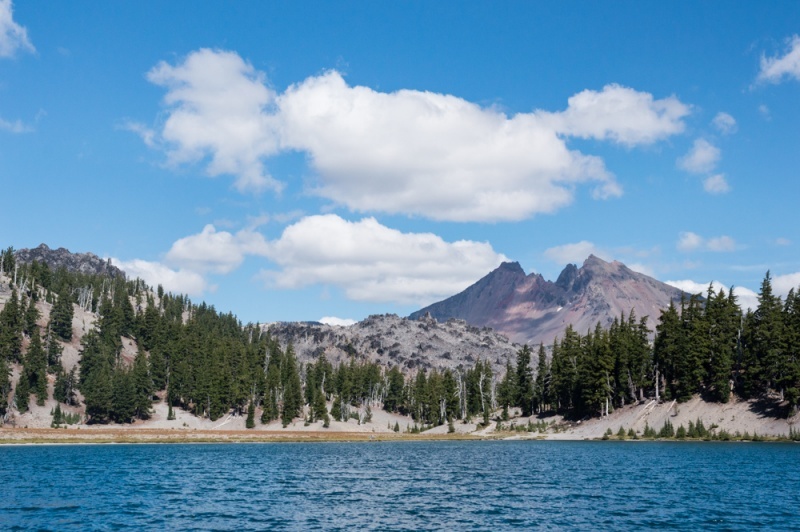 The Cascade Lakes Highway is one of the most scenic drives in all of Oregon and something you must do during your trip to Bend! The drive is 66 miles in length and should take you about 3-5 hours depending on how often you stop. 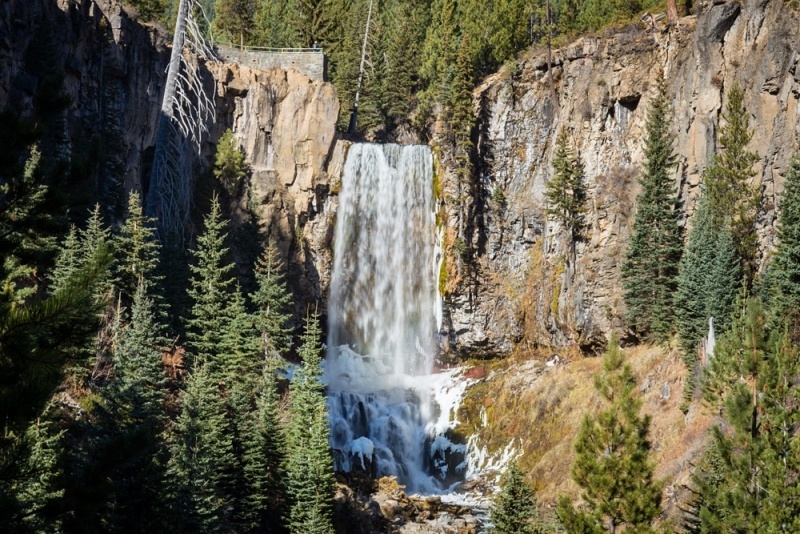 As you leave the city of Bend and head into the Deschutes National Forest you’ll begin to catch a glimpse of the towering Cascade Mountain views that this drive is known for. Be sure to take your time and stop often. There are countless viewpoints along the way, as well as several hiking trails and lakes that are too beautiful to pass by. The road is only open seasonally due to snow conditions. It generally opens in June and closes in October beyond Mount Bachelor. Be sure to check road conditions before you head out. 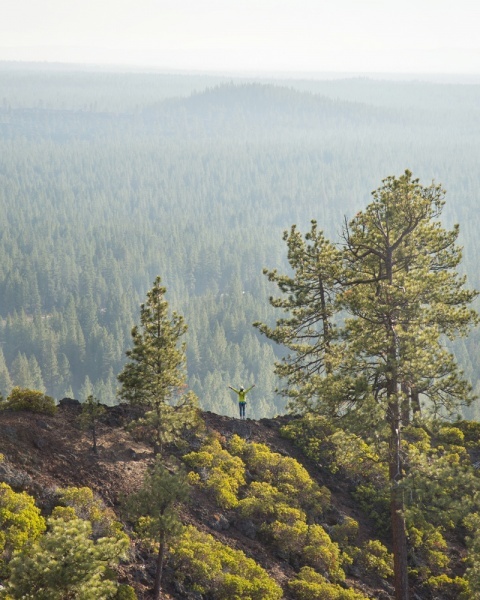 As if you don’t already have enough outdoor adventures to do in Bend, we’ve got one more to add to the list – go mountain biking! It’s a popular pastime for locals and tourists so you’ll find shops to rent a bike and gear, and hundreds of trails to explore. If you don’t have your own mountain bike, no need to worry, there are plenty of rentals available around town. And if all that isn’t reason enough to visit the quaint town of Bend, maybe the fact that it’s home to the last remaining Blockbuster store in the US will! 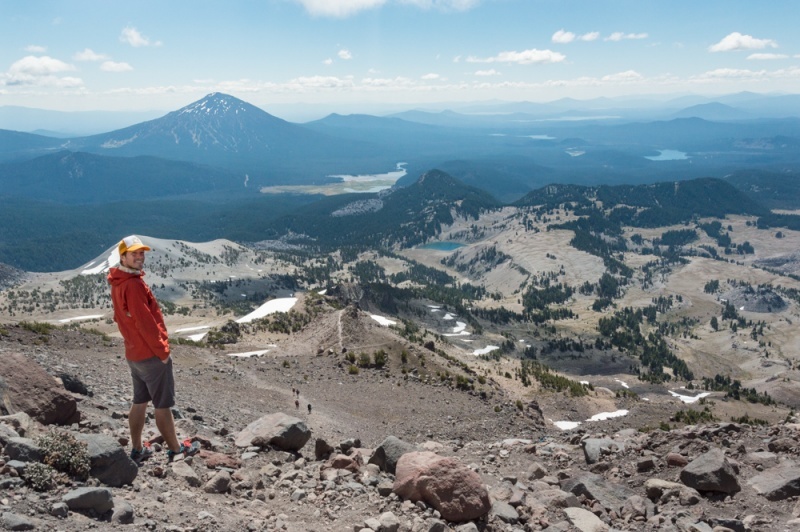 Need some Central Oregon hiking inspiration? Check out our favorite guides to the region!